Day to day activities including Club de Artesanas (CdA) gatherings were disrupted throughout the month of July for fun and politics. The people of the municipality of Independencia held numerous meetings to allow their elected mayor every opportunity to give an honest accounting of himself in the regards to an alarming amount of funds missing from the municipal bank account. 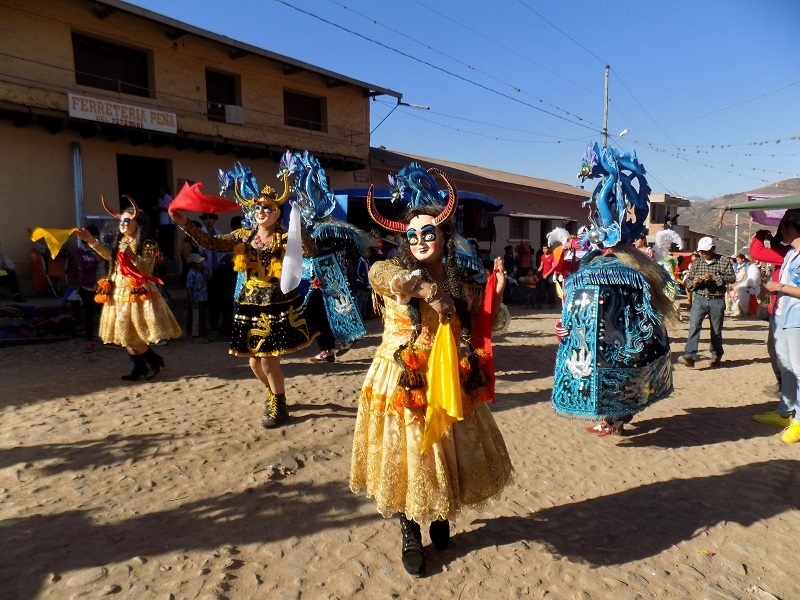 The meetings and investigation were interrupted in the middle of the month for the annual 5 day Fiesta del Virgen de Carmen. The Fiesta fell over a weekend so many city folk with roots in Independencia arrived for the festivities. The idea of Club members working together in an income generating activity during the Fiesta was vetoed because of family responsibilities. The Virgen de Carmen is the patron saint of Independencia and a lovingly attired idol resides year around in a glass case above the altar of the Catholic Church. 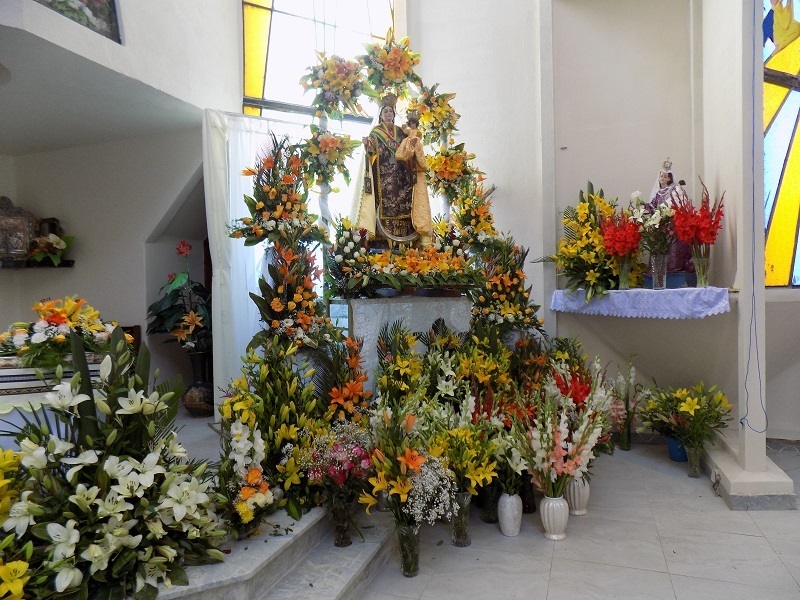 During the Fiesta she is taken down to hold reign at the front of the church, and to be carried through the streets in a procession on July 16th. 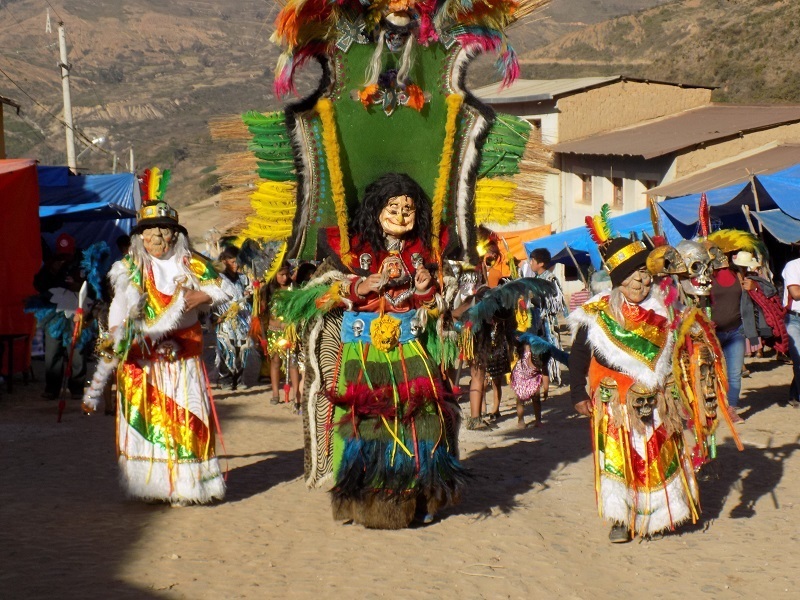 The 5 folkloric dance “fraternities” danced through the streets accompanied by brass bands for 2 days in devotion to her. The plaza was packed for 3 nights with the young and old dancing to popular music bands. The Fiesta and winter vacation ended and life returned to normal the 3rd week in July. 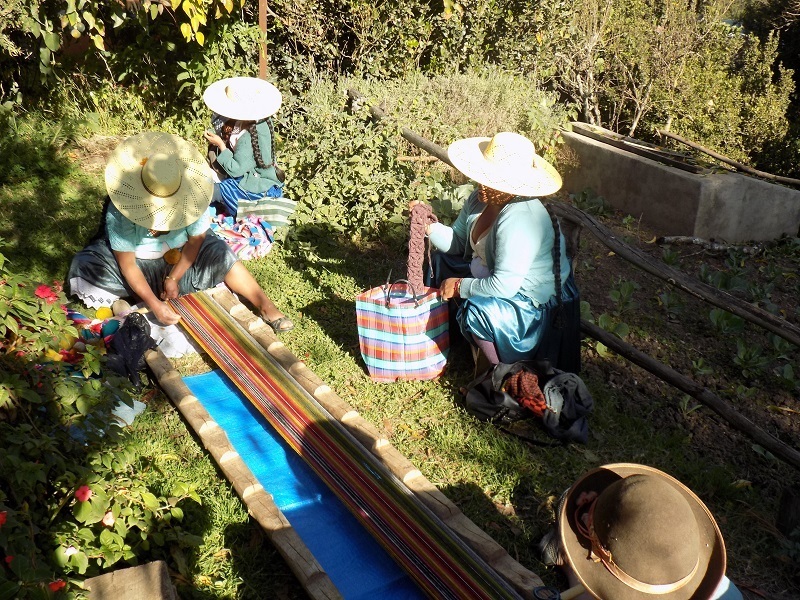 The Club women warped weavings for orders and worked on crochet projects. The Club chicas were all present for the first time in a month and they pulled out the bag of unfinished “Little Red Riding Hood” puppets to finish. 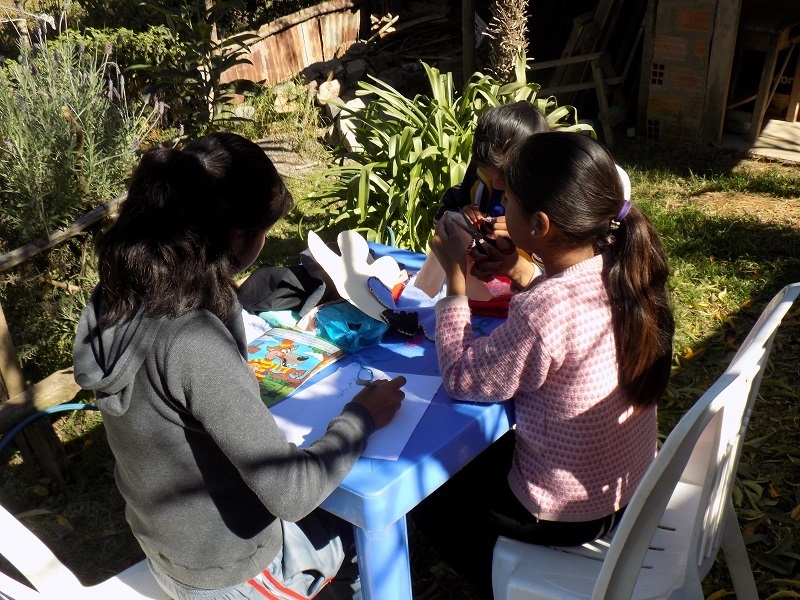 That project was begun by a volunteer, Profesora Judy an art teacher in 2015, whose stay was too short for all the project ideas she brought with her. The chicas are working their way through a baking course where each will learn 4 recipes then teach them to each other. Upon demonstrating competence in the 4 categories that include cake, cookies & crackers, sweet bread & pastry, and a yeast bread they will be rewarded with a set of measuring cups and spoons. Independencia was thrown into turmoil the 4th week in July when the increasing evidence of fiscal wrongdoing demanded action. Doña Máxima found herself locked inside a packed auditorium of concerned citizens at city hall until 4am on Saturday morning. They voted to close down the municipality except for the schools and hold a public meeting in the plaza on Monday. Late Sunday night the gate entering into the town of Independencia was chained shut. Trucks and buses were parked crosswise across all streets in and out of Independencia, and so began 3 days of blockades and strikes. 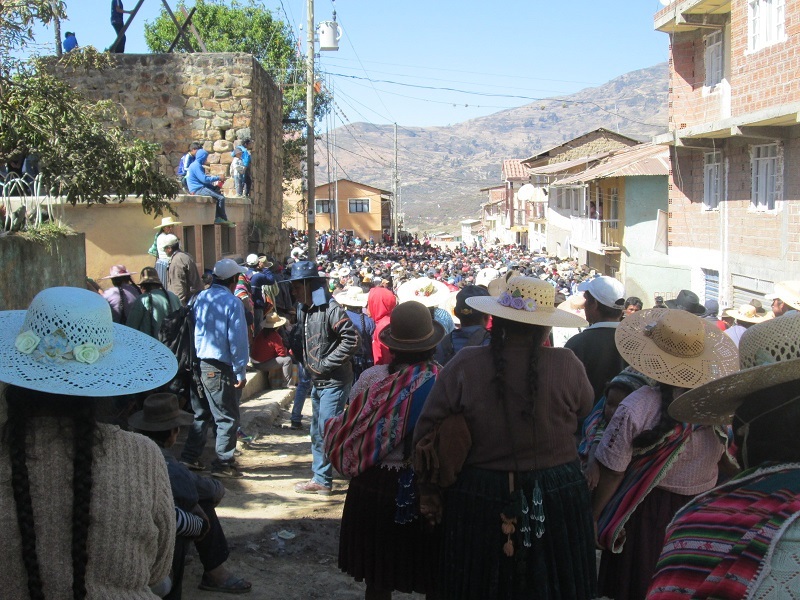 On Monday, the surrounding rural communities sent representatives to Independencia to participate in the decision making. They arrived in the back of cargo or dump trucks prepared for a 1 day meeting in the plaza that stretched out to 3 days. Those who did not have a place to go at night camped out in the plaza probably regretting that warm woven wool ponchos have gone out of common use. Doña Máxima dropped by PAZA on Tuesday with a report. The general strike called for all businesses to be closed. Neighborhood vigilante teams had been organized to patrol their neighborhood to make stores did not open. Stores in Independencia are a room in homes with a door opening to the street and shelves of staples inside. If a store opened the vigilantes were to strip the shelves in punishment. However, people have to eat so between 6am and 7am a blind eye was turned as some covert transactions of eggs, rice, and flour took place. The vendor market was padlocked shut, but on Tuesday and Wednesday mornings in front of the market women sold meat out of wheelbarrows. Locals were allowed to prepare pots of food, sardine salad, empanadas, etc. to sell out of baskets or wheelbarrows to those without a means to cook for themselves. A delicate balance between policy and meeting basic needs was reached. Doña Máxima cooked for the representatives from Huancarani and PAZA donated rice and vegetables to her efforts. It took 3 long days of speeches, votes, and collective hardship to arrive at an interim plan of action until elections can be organized and held to replace the former mayor. 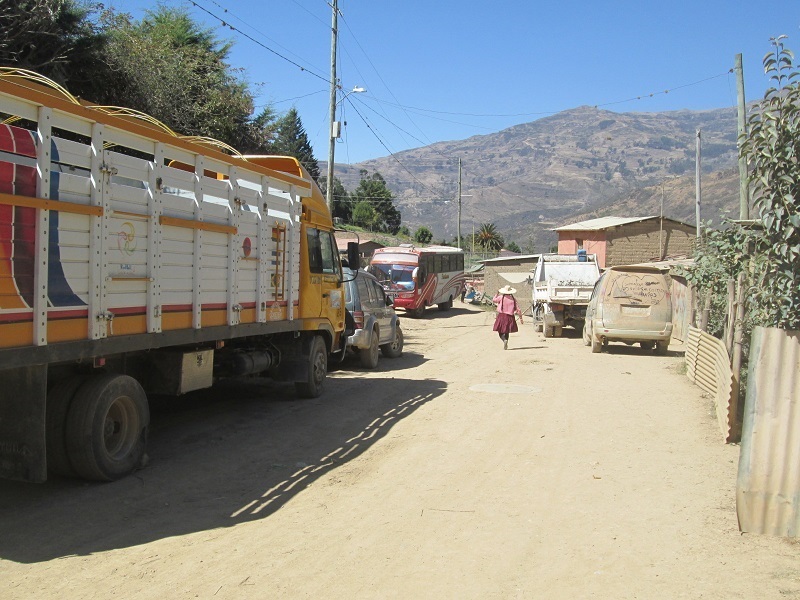 There were dramatic twists and turns throughout the 3 days including his arrest in Cochabamba and 2 small districts going renegade after being stirred up by his brother. Representatives of the miners of Kami arrived in Independencia during the final day of meetings and brought dynamite as their bargaining chip. An accord was reached, so windows just rattled instead of broke when they bade their usual farewell by setting off a few sticks well outside of the town’s border. The blockades were lifted and it was business as usual on Thursday.